I had intended to read most of the day, but when the sun came out about half an hour ago, I figured a walk would clear the cobwebs better than another cup of coffee. I changed into my gear, and then, everything got awfully dark. And then…the skies opened. OK, OK, I get it. No walk today. Even if the sun comes out again, which it probably will, this day is just too moody to predict. And now it’s thundering. 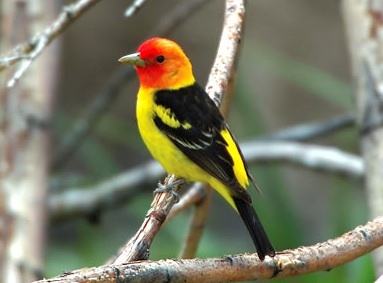 However, just thought I’d mention that I saw a Western Tanager yesterday. It popped out of the canopy for a few seconds, and then disappeared. It was so colourful and lovely, I thought it was an escaped tropical bird, but no, it’s a local…at least in the late spring, early summer. It’s my very first Tanager.